We’ve now got (almost) all of government’s content on GOV.UK. We’ve learned lots about joining up government content and rebuilt the Publishing Platform, so now it’s possible for us to make even better improvements to the single domain, with a clear goal of meeting user needs. 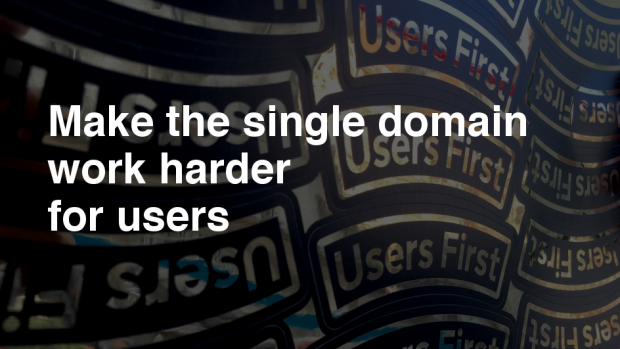 Our goal - to make the single domain work harder for users - aligns with the Transformation Strategy and to the GOV.UK vision Neil published at the start of last year. We’re doing this work so that we can transform the relationship between citizen and state. We (GOV.UK) play a major part in leading and coordinating the work of the Transformation Strategy and making the vision happen, particularly as we run the central platforms. Our bit, the Publishing Platform itself, is the where the “relationship” actually happens - so we’re in the middle of everything. It’s going to be a busy year for GOV.UK, in which we’re going to change both our direction and our pace. The 2017 to 2018 roadmap is a combination of tactical, achievable, visible bits of work, alongside longer term transformational work. It will stretch us, but the reward will be great - GOV.UK will be an even greater example of how government should serve users. Each of our objectives will contain several missions, and each objective helps us achieve our overall goal: to make the single domain work harder for users. This is the work to build on what the Finding Things team have learnt from improving education content, creating a new taxonomy, and the work on content improvement themes. We’ll do 3 big content themes in the 2017 to 2018 financial year, and aim to complete all major content themes by 2020. We'll have grouped content into the first version of a new taxonomy and uncovered the duplication and overlaps, and fixed the ones we can. Departments and agencies will be left with a much better understanding of how they need to work internally and together to continue to transform and maintain it for users. The plan is for departments to own this change to their content, and getting the first version of a new taxonomy out there, rather than (necessarily) doing a perfectly complete content audit and taxonomy. If we can do both, that’s great, but we need to be realistic about how much time we have. There are two main parts to our second objective. The first is to make improvements to the 10 tasks that, for the last few years, we’ve tested twice a year in our benchmarking sessions. We do this to find out if GOV.UK is getting easier to use over time. We’re going to do more work based on the results of that research, so that we start to see the successful completion rate go up more quickly. That work might cover content, pattern or navigation changes and the team will focus on the most valuable changes they can make in the time available. Secondly, we know that site search still has a lot of room for improvement and we’d be unwise to wait longer to work on this. So there’ll be a stream of work to improve search on, and to, GOV.UK next year too. It’s fundamental. The first step in our third objective is finding out what the needs are of people and organisations who scrutinise government. It should be easy to see how and what government is changing. So we’ll begin by doing a discovery into these needs. We’ve also made 2 commitments to the Open Government Partnership. The first is to make it possible for end users to easily see how content has changed over time. The second is to provide a supported API for content, so that anyone can reliably take a feed of our page content. Over the course of the year we will be improving GOV.UK’s email subscription service. This is related to the new taxonomies that will be created through the ‘group and transform content’ objective. But this work is also related to the discovery we completed in the 2016 to 2017 financial year that showed where we’re not meeting user needs well. We’ll also be looking to rebuild the worldwide publishing section on GOV.UK too. These are formats we decided not to migrate to the new Publishing Platform when we learnt from the discovery into international user needs in 2016 that these formats, and the associated content, were not meeting user needs well. We’ll also continue the work to improve our front-end architecture so that it’s simpler to maintain and develop upon, and then follow that by spending time improving how our platform applications work for publishers. That should be good timing given the work towards the start of next year on the content performance API, content history and front-end architecture. The infrastructure team will have a packed year too, aiming to make it easier for GOV.UK product teams to host, release, maintain and support their applications. They’ll be starting by launching a new deployment pipeline. We also intend to rebuild the licensing service, starting with user needs so that we can re-think what it should do and how it should function. We’ll also look at who will look after it in the future. Lastly, we’ll be continuing work to improve our campaign and blogging platforms too. No mission will be longer than 3 months (and many will be shorter). We are building in the flexibility so that we can change direction. Time is fixed, scope can be trimmed. We’ll use more robust metrics to see how we’re doing. We’ll have 3 Firebreaks through the year, for everyone - just 1 week long each. We’ve set aside time to improve things, but left the details open so we can pick the most useful thing when we get there and so teams have autonomy of scope. You can see how this looks on our draft roadmap for the next financial year. We’ll be publishing a blog post soon that covers the process we followed to create our roadmap. The next step for us is to form teams around each of the missions. Once that’s done we’ll help them write up the mission in more detail and put it on the roadmap - so expect more detail soon. We’re also already busy deciding what we’ll do in our ‘2 week blitz’ too. PS. The roadmap plans are on top of our ‘business as usual’ work. In fact, the roadmap is work we do only after we ensure that GOV.UK is secure, reliable and performs as it should. Jennifer Allum is GOV.UK's Lead Product Manager. You should follow Jen on Twitter.